How long does this firmware update typically take? I pulled out my Cricut V.1 and hooked it up to my laptop and CCR and it has been "updating" for at least an hour! Hi Narelle, I tried this and it still didn't pop up! 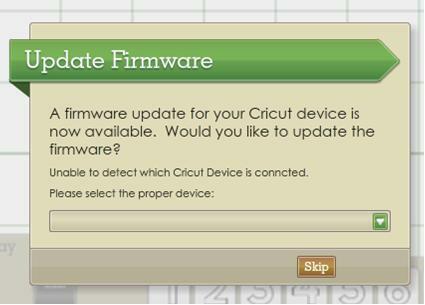 I'm not sure if I actually need a firmware update but basically when I go to cut I click "Load Mat" in CCR and nothing happens! The wheels on the machine don't roll or anything. Any suggestions?? @ Ms. Lucie - It should only take about 20 minutes to update. If it stalls, you probably need to start again. And you could try disabling your anti-virus/firewall before you start. @LibbyLu - Which Cricut are you trying to update? The required firmware is in the post above. If you already are at the correct level then an update isn't needed. Is your Cricut being recognised by your computer when you switch it on? 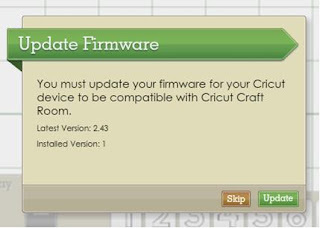 And have you installed the Cricut drivers from the Help menu in CCR? Thanks!!! I am updating as I write this. You rock!!! Hi there! This may be a really dumb question, but exactly where is the stop button the the Expression 2? Is it the pause button next the the on/off button? We just moved a month ago, and I turned my machine on for the first time today. LCD screen is blank - no light or anything. Machine does power on. Trying to update, but no program recognizes my machine :( Any help would be great! Michelle, this doesn't apply to the E2. To update the E2 you need to use Cricut Sync. But if your machine isn't even powering on it sounds like there's a major problem with the either the machine itself or the power cord. Best idea is to call Cricut Customer service. Will it mess up my machine if I restart the updating? Four hours is way too long for an update. Stopping and restarting is the way to go. I have an Expression. I did the update and now when I try to cut anything from CCR, it loads the mat then it just stops and won't do anything else. I will not cut. The Expression says it is USB active and it is V2.43 but will not cut. After the mat loads, the display says Mat 12x12 and then goes back to insert cartridge, gypsy or design studio....any ideas?